In many ways, Raj Kissu Rajandran, founder and CEO of Omnimatics Sdn Bhd, fits the quintessential profile of a millennial. He harbours big dreams of changing the world through his company. He put himself through the start-up grind by renting a house in Bangsar, Kuala Lumpur, to stay close to the scene (and blowing a hole in his savings in the process). And he participated in the sharing economy for a good few months to make ends meet. But when it comes to wealth, the 32-year-old takes a more practical view. So, rather than accumulating material possessions and having an overflowing investment portfolio, Raj believes that knowledge is the most valuable currency. “To me, wealth is about knowledge. It is about knowing how to apply that knowledge and having the freedom to do so. Everything I have built so far is based purely on what I have learnt in the past and what I continue to learn today,” he says. Adopting this mindset has paid off. Today, Raj runs a four-year-old Internet of Things (IoT) company that offers telematics services and real-time fleet management capabilities to businesses. “We are the first company in Malaysia to build and deploy a remote vehicle control system for the on-demand car-sharing industry,” he tells Personal Wealth. Born to parents who run a small insurance brokerage, Raj grew up in a household that lived by the saying that “basics is best”. The oldest of three siblings, he was in his early twenties when his dad suggested diversifying into unit trusts. “I had some savings and fixed deposits (FDs) by then, but he encouraged me to put my eggs in other baskets as well. I started with very small quantities to be honest. A day trader would laugh at the amounts I was investing,” says Raj. In time, Raj worked up the nerve to invest in, as he puts it, a small basket of very safe, dividend-paying stocks in the local telecommunications and banking sectors. “I learnt not to be emotionally attached to my investments and to have the discipline to cash out once I hit the appreciation targets that I had set for myself. Then, I would put the money into much safer instruments such as FDs. I usually saw a return of 10% to 12% from my stock holdings,” he says. Raj did have something else going for him. He had picked up good investment habits at a previous workplace. Early on in his career, he worked in the IT department of ECM Libra Financial Group Bhd and many of his colleagues were investors. Raj is a keen student of new technology trends and innovations. Recognising the potential of technology to reduce the cost of trading, he started trading online with iSPEED.my about two years ago. “I tend to buy and hold stocks for a period of time. I treat this as more of a learning experience than a job. With the online platform, my returns have ranged from 5% to 8%,” he says. Raj decided to move out of his childhood home in his early twenties. While this was an unusual move for an Asian, he felt that it served a deeper purpose than just gaining freedom. “I felt that living at home caused me to be a little sheltered. I knew very early on that if I wanted to pursue my dream of starting a business, I had to radically alter my mindset and become a different person,” he says. Raj spent the next few years honing his programming skills at various software companies. He worked for a couple of local start-ups early in his career. It was then that he discovered a desire to venture out on his own one day. Eventually, he tried to get his start-up going when he was still working full-time. “It was early 2015. I was 28 and had been juggling a full-time job and trying to get my start-up off the ground for a few months. But with all the consulting work and international travel I had to do for my then employer, I realised that I was burning out. So, I figured that since I was not married and did not have any major financial obligations yet, I would spend the next 18 months trying to start my company,” says Raj. It was at this point that he decided to quit his job and pursue his start-up dream full-time. The change of pace was welcome as it gave him more time and space to flesh out the ideas he had been sitting on. The excitement kicked in and he was feeling the start-up rush. “I knew I needed to be at the heart of the start-up ecosystem. So, I made the decision to rent a house in Bangsar. It was the place to be if you wanted to network, catch an idea or figure out how to build a product,” he says. Raj had a fair bit of money tucked away, thanks to his low-maintenance lifestyle. Even so, the rent ran in excess of RM2,000 a month and it was was burning a hole in his savings. Worryingly, he had not found his billion-dollar idea yet and was no closer to setting up his company than he was at the start of the year. Ever the enterprising millennial, Raj convinced his landlord to allow him to sublet the rooms in the house on Airbnb. “That felt good, being able to rent out the rooms in the house. It certainly helped me out financially and taught me about getting a better handle on my finances,” he says. He also picked up a few freelance programming gigs and signed up as a driver with Uber and Grab. “I thought this was a great alternative as I could just drive people around, make some money and still have time to figure out what kind of business I wanted to create. But really, I was hoping the change in locations and environments would help spur the creative juices in me,” says Raj. His time behind the wheel worked like a charm and soon enough, the inspiration came to him. “I have always had a very utilitarian view of cars. For me, it was just about getting from Point A to Point B. It just so happened that I had a car and I used it to stay afloat financially,” he says. While ferrying passengers around, Raj realised that he could potentially empower private vehicle owners by giving them advanced and highly specific knowledge about their vehicle’s overall health. If he could bring telematics technology to private vehicles, owners who lack technical training and automotive skills would no longer be at the mercy of auto repair workshops. The technology, called Omnimatics Fleet (formerly known as CARdio), is capable of a variety of functions. “We deploy connected vehicle technology for our clients. With our technology, a user or business owner is able to track the location of the vehicle in real time as an anti-theft measure. The technology provides information on driving behaviour so as to gauge how safe or reckless a driver is. This is a great feature to minimise vehicle wear and tear and prevent reckless driving,” says Raj. As a result, Omnimatics Sdn Bhd was launched in the middle of 2015. Raj immediately put his considerable programming expertise to use, developing the software and seeking out manufacturing partners to develop the various IoT sensors to install in customer vehicles. Very early on in the venture, however, he realised that there was a problem. He initially set out to bring telematics to the consumer market, but he quickly realised that the market was not ready for his proposition. “The more market research I conducted, the more I realised that the market was not ready for the kind of technology I wanted to develop. In addition, the ringgit had been falling against the US dollar for some time and that made purchasing the hardware a challenge. Early on in the business, we were buying our hardware from overseas,” he says. Funding was another challenge. Omnimatics received some pre-seed funding from local tech start-up accelerator Watchtower and Friends in the middle of 2015. That was all the external funding Raj would receive until the middle of last year. He remained disciplined during those tenuous months, surviving on his own dwindling savings and supplementing that with driving for Grab and Uber, in addition to taking on tenants via Airbnb. “I did all I could to minimise the burn rate on my savings and make ends meet. Of course, that meant I could no longer go out drinking every other weekend either,” he laughs. Despite the financial and business struggles, Raj was not prepared to abandon his idea. In 2016, he made the decision to enter the business-to-business space. “The fleet market is good because as long as you can help a company cut its fleet costs, then you have an ‘in’. And once I pivoted, I managed to attract fleet clients,” he says. 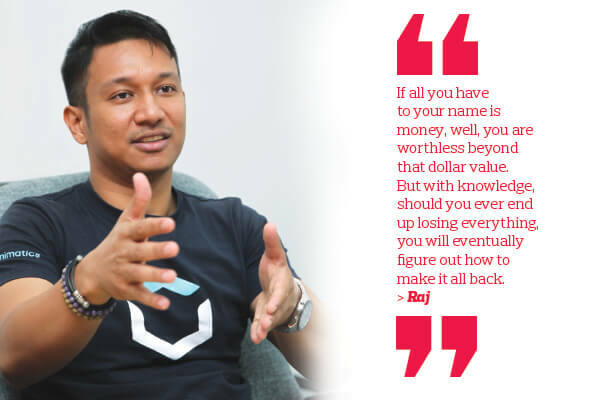 Raj gradually carved out a niche for himself by, ironically enough, providing telematics services to the burgeoning on-demand car-sharing industry in Malaysia. “Our technology is used by the likes of on-demand car-sharing service GoCar and local car rental company Mayflower,” he says. In a sense, Raj had finally made it. He had found his “in” in the country’s fast-growing on-demand car-sharing sector. He had a small but growing stable of ride-sharing customers and things were looking up. But he wanted to take the company to the next level. “I had a few options in front of me. I could continue trying to grow the business organically, albeit in an already red ocean industry that was saturated with other service providers. Trying to scale organically in this market could take a very long time,” he says. Yet, there were challenges. Raj knew that auto manufacturers were beginning to provide some variation of telematics to their customers. Insurance companies were also getting in on the action, offering improved motor insurance rates by monitoring their clients’ driving habits in real time via telematics. The longer he persisted alone, the greater his risk of failure. In fact, he had opportunities to partner insurance providers and provide telematics solutions to their motor insurance clients. His telematics-to-the-masses concept was a little ahead of its time, although that was not the only problem. “Motor insurance detarification did not come into play in Malaysia until the middle of 2017. The concept is simple enough — insurance policyholders would subscribe to a usage-based insurance plan that requires the purchase of a telematics device,” says Raj. “Through this device, insurers would be able to score drivers based on their driving habits. Cautious drivers would be rewarded with potentially lower insurance premiums and other perks while reckless drivers would not. In theory, this would help improve safety by incentivising responsible driving. Although once again at a pivotal juncture, Raj found himself in good company. Nearly 10 years ago, Daimler — the parent of German automotive giant Mercedes-Benz — purchased close to a 10% stake in struggling automotive start-up Tesla Inc. The US company belonged to Raj’s idol, the trailingblazing billionaire Elon Musk. Tesla was on the verge of failure, just as the US was in the grip of a major automotive downturn. The nearly US$50 million investment provided Musk and Tesla with the liquidity to stave off bankruptcy. Just five years later, Daimler sold its stake in Tesla for nearly US$800 million. “I used to read a lot about Musk, Bill Gates and the late Steve Jobs. I think I have always related to Musk simply because he is the biggest risk taker of the three. He is also arguably the most technically inclined of the three. Musk is a multi-disciplinary expert. He takes the time to learn as much as possible about his chosen industries,” says Raj. He decided to sell a significant 52% stake in his company to APM Automotive Holdings Bhd, one of the largest automotive components manufacturing groups in Malaysia. The deal, valued at RM2.225 million, was finalised in the middle of last year. He remains CEO of the company. “I realise a lot of millennials think big corporations do not know anything,” Raj jokes. “But APM has been in the automotive manufacturing sector for about 50 years. It knows the business inside out. It has billions to its name, so it must be doing something right. The company currently services about 1,400 vehicles. These days, Raj and his team are keeping themselves busy by creating a new product for the market. However, he remains coy about its release or which market the product is intended to serve. “We will make an announcement on this soon,” he says.